Among the many qualities of PET, is its full recyclability. You can recognise that a bottle is made of PET and therefore is recyclable, thanks to the marking on the label or the marking on the bottom of the container. The recyclability symbol is made of three arrows chasing one another and a number (ranging from 1 to 7). PET is identified by the number 1. Ok, so PET is recyclable. Does it mean that it is recycled? I’m sure you’ve always wondered if the bottles that you separate from your ordinary waste do get recycled. Well, they do! Contrary to what happens for glass containers though, PET gets recycled into many different products, not just back into bottles. The vast majority of recovered PET gets recycled into fibres. Fibres are then used to manufacture a wide array of products: carpet, padding and even clothes! Did you know that your soft, warm fleece jacket might very well have started out as a beverage container? The PET recovery process is quite complex. Once you have separated your recyclables from your ordinary waste, these are brought to what is called a Material Recovery Facility (MRF). There, the various streams are separated from one another, that is carton is set aside with carton, aluminium with aluminium and PET bottles with PET bottles. The separated material is then baled (compacted into a big bundle weighing about 600 Kg) and sold to a recycler, like our company. The recycler thoroughly cleans the material, and then sells it. PET bottles are first ground into tiny flakes. These flakes are washed and dried and once dried, they are ready to be sold to those manufacturers who will use them as a raw material. 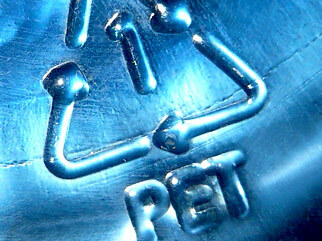 RPET is the name given to the recycled PET flakes.